First time here? Click here to enter the Excellence in Financial Journalism Awards. Want to enter the Book Category? Click here. The 2019 Excellence in Financial Journalism Awards will consist of 13 awards in 10 categories (print, broadcast, online, and social platform entries are eligible to be submitted to any category). New this year is the NextGen category which is limited to current college/university students. Exemplary coverage of a business, financial, or economic news story using radio, podcasts, social media or other online audio formats from a Small or Medium / Large media organization. In recognition of an exemplary business, economic, or financial story in any medium featuring in-depth research, journalistic initiative, reporting and creativity. Exemplary coverage of a business, financial or economic news beat in a newspaper, magazine or online format. Outstanding graphic representation of information, data, or knowledge presenting complex financial information in a clear, concise, visual format to enhance a story narrative. Exemplary business reporting by a newspaper, magazine, television, radio station, online format, or website focused around a geographic area whose primary audience are the residents in that area. Distinguished commentary, including editorials, columns, blogs, podcasts, video, on business, economic or financial topics. Laudatory reporting on a business, financial, or economic topic that will be judged on its impact on the public and the degree to which it benefitted the public good. Exemplary coverage of a business, financial, or economic news story in a television, live stream, or other video format from a Small or Medium / Large media organization. Current college students who showcase exemplary coverage and reporting of business, financial, and/or economic topics. Audio coverage can consist of radio, podcasts, social media or other online audio formats. Submissions may consist of one full-length audio feature or one audio package of up to five parts and must be at least 45 seconds in length. Video coverage can consist of television, live stream, or other video formats. Submissions may consist of one full-length program or one video package of up to five parts and must be at least 45 seconds in length. Digital coverage can consist of: webcasts, podcasts, television and radio entries must be at least 45 seconds in length. A script or transcript with lead-in is strongly recommended but not required. Each submission in any category is limited to a maximum of five parts. Journalists from The Wall Street Journal, Crain’s New York Business, Forbes, New York Times, and other publications, keep CPAs up-to-date with relevant and interesting news related to the global market, economics and other varying business and financial topics concerning New York State and the CPA profession. 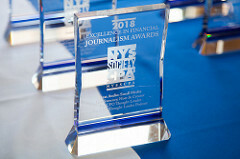 For more than 30 years, the NYSSCPA have used the EFJ Awards to pay tribute to journalists who have contributed to financial and business topics through their work. Each year we invite journalists, editors, and authors to submit their best work in 10 different categories. Once winners are selected, the NYSSCPA holds a luncheon to celebrate the year’s most disgusted reporting that cultivated and promotes an understanding of accounting, finance, and business topics. Any business, finance or accounting-related news story published in the 2018 calendar year is eligible for entry. The journalist or the outlet may submit the entry. There is a $75 initial entry fee. Any additional submissions from the same contestant are $50. The Next Gen Award initial entry fee is $20. Any additional submissions from the same contestant are $10. Deadline to enter is March 29, 2019. If you have any other questions, send an email to journoawards@nysscpa.org or contact Maya Lindsay at (212) 719-8350. Examining a significant and complex subject with depth and context.